Aston Magna’s 2013 season schedule runs from June 13 through July 13 with concerts at Bard College at Simon’s Rock, at Brandeis University, and at Bard College, Annandale-on-Hudson, plus a June 29 concert at the Mahaiwe Performing Arts Center in downtown Great Barrington, MA. The season, which will begin on the weekend of June 13-15, will be under the musical direction of Daniel Stepner, Artistic Director and violinist, and will feature many of our most prominent artists, including sopranos Sharon Baker, Dominique Labelle, and Kristen Watson; clarinetist Eric Hoeprich; oboist Stephen Hammer; gambist Laura Jeppesen; theorbist Catherine Liddell; harpischordist Peter Sykes; and trumpeter Josh Cohen. 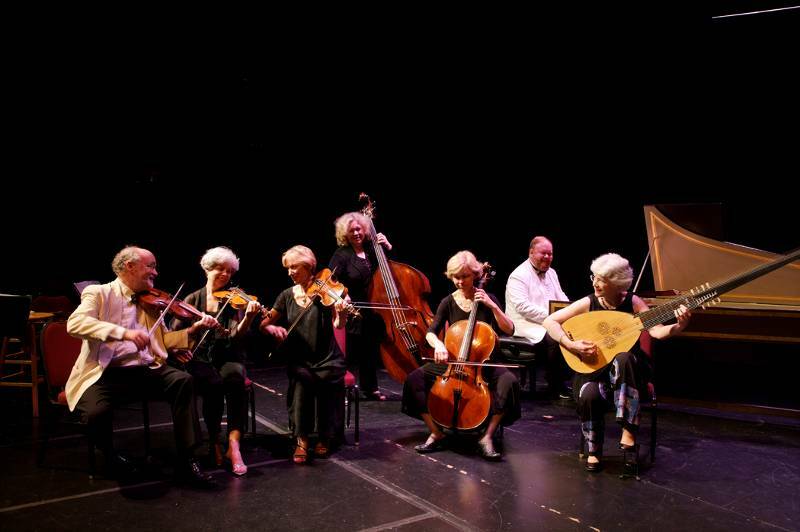 This summer’s five Aston Magna Festival programs will be performed at Slosberg Auditorium at Brandeis University in Waltham, MA, on Thursday evenings, June 13, 20 and 27, and July 4 and 11 with concerts beginning at 8:00 p.m. The concerts can be heard on Friday evenings, June 14, 21 and 28, and July 5 and 12 at 8:00 p.m. in the air-conditioned auditorium of the Olin Humanities Building on the main campus of Bard College, Annandale-on-Hudson, New York. Four of the concerts on Saturdays, June 15 and 22 and July 6 and 13, will take place at the Daniel Arts Center at Bard College at Simon’s Rock in Great Barrington, MA, at 6:00 p.m. The concert on Saturday, June 29 will be performed at The Mahaiwe at 8:00 p.m. A pre-concert lecture by Daniel Stepner will be featured one hour before all concerts, and audience members are invited to “Meet the Artists” post-concert. Audience members are invited to a wine and cheese reception following all concerts at the Daniel Arts Center and the June 29 Mahaiwe concert. For the first concert weekend, on June 13, 14, and 15, clarinetist Eric Hoeprich will introduce the unfamiliar but hauntingly beautiful chalumeau. The program will highlight this once popular instrument, a relative of both the recorder and the clarinet, in works by Handel, Vivaldi, and others, including Holy Roman Emperor Joseph I. Stephen Hammer on baroque oboe, and Kristen Watson, soprano, will also join Mr. Stepner, who will lead a small ensemble. The second concert will be devoted to music of Johann Sebastian Bach for harpsichord and violin, and will feature all six sonatas for violin and harpsichord. It will be performed on June 20, 21, and 22. Violinist Daniel Stepner and keyboardist Peter Sykes will perform. During the third weekend, June 27, 28, and 29, the Saturday evening performance will take place at the Mahaiwe Performing Arts Center at 8:00. The concert will present music by Bach and French composer Marin Marais, whose life was portrayed in the film Tous les matins du monde. Soprano Dominique Labelle will solo in works by Marais as well as in Bach’s “Jauchzet Gott in allen Landen.” The second Brandenburg concerto will also be performed. The ensemble will include gambist Laura Jeppesen, theorbist Catherine Lidell, baroque trumpeter Josh Cohen, and a chamber orchestra led by Mr. Stepner. Monteverdi madrigals will be performed on July 4, 5, and 6, together with those of one of his predecessors, Giaches de Wert. Masterful and imaginative musical settings from the 16th and early 17th century will be the fare with Aston Magna’s Madrigal Singers performing. For the final concert weekend, July 11, 12, and 13, Aston Magna explores the musical library of America’s third president, Thomas Jefferson, illuminated by excerpts from his writings. An accomplished musician himself, Jefferson collected a good number of musical gems, including music of Corelli, Mozart, J.C. Bach, Maria Cosway and Francis Hopkinson. Performing will be soprano Sharon Baker, violinist Daniel Stepner, and harpsichordist Michael Sponseller. In conjunction with the first two concert weekends, period instrument workshops will be offered at Brandeis University. On June 9-14, workshop classes and private instruction will be offered by Mr. Hammer, oboe, and Mr. Hoeprich, clarinet, exploring Mozart’s use of wind instruments in The Magic Flute. In the June 16-21 workshop, Mr. Stepner will offer sessions on Bach’s works for unaccompanied violin, geared to both modern and baroque violinists. For more information, please consult the website, www.brandeis.edu/summer/music/. For information or to order tickets to the concerts at the Olin Auditorium on the main campus of Bard College, Annandale-on-Hudson, NY, please phone 845-758-7887. Individual tickets purchased in advance for concerts at Olin Auditorium are $35 ($30/seniors). Students with valid full-time student ID, or under the age of 25, may purchase up to two $5 student rush tickets on the day of the performance. Student rush tickets are subject to availability. Tickets to these concerts are not available online. Tickets to the June 29 concert at the Mahaiwe Performing Arts Center can be purchased by calling 413-528-0100 or on line at www.mahaiwe.org. Audience members are invited to a wine and cheese reception following the June 29 Mahaiwe concert. Subscriptions to the Festival are available at Slosberg Auditorium, Brandeis University, and at Daniel Arts Center, Bard College at Simon’s Rock. Single tickets purchased in advance for the Slosberg Auditorium concerts are $30 ($25/seniors); subscription tickets are discounted at $5, $4, $3 and $2 per ticket, for 5, 4, 3, and 2 concerts, respectively. Individual tickets purchased in advance for concerts at the Daniel Arts Center are $35 ($30/seniors); subscription tickets are discounted at $5, $4, and $3 per ticket, for 4, 3, and 2 concerts respectively. Buying in advance also saves you an additional $5 over the price of individual tickets at the door. Student rush tickets at $10 are available at the door at all concerts. Aston Magna encourages parents to bring the kids! Children 6 to 16 are free, two per each paid adult ticket at Daniel Arts Center. Tickets or information to concerts at the Daniel Arts Center and at the Slosberg Auditorium may be ordered by calling 413-528-3595, (out of area 800-875-7156) or on line at www.astonmagna.org.